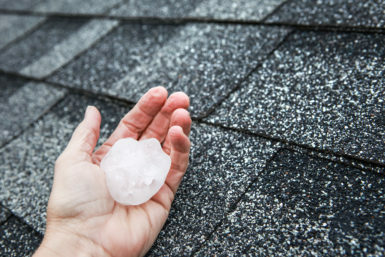 Has hail damage turned the roof on your home into a pock-marked mess? If so, it’s important that you have your damaged shingles repaired as soon as possible to prevent moisture penetration and the inevitable roof deterioration that comes with it. If you live in the Fairview Heights, Illinois area, then Daech & Bauer Roofing can provide the repairs you need. We’re a full-service roofing contractor that has extensive experience providing repairs for weather-related damage. We’ve completed more than 10,000 projects in the region, and our commitment to providing the highest level of service possible has helped us to earn recognition as one of the Top 100 Roofing Contractors in the U.S. from Roofing Contractor magazine. Finally, once your claim has been paid by your insurance company, our roofing technicians will make sure your repairs are completed with precision and that your roof is returned to optimal condition. We will also back our work with a five-year labor warranty to give you added peace of mind. If you would like to schedule a consultation at your Fairview Heights, IL home, contact Daech & Bauer Roofing today.